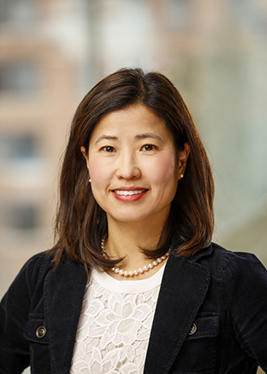 Over the past decade, Hyekyun Rhee has established an internationally-recognized program of research developing innovative approaches to asthma self-management using technologies and peer dynamics to improve asthma outcomes in adolescents. Among these approaches include an award-winning wearable device that monitors symptoms around the clock. Data from the Automated Device for Asthma Monitoring (ADAM) can be recorded and downloaded to a smartphone or computer and analyzed for patterns of symptom frequency throughout the day, guiding medication or behavioral adjustments. The device has been recognized as a leading wearable innovation in health care and is being further developed by a start-up company, Health Care Originals. Rhee is also conducting an NIH-funded study evaluating a peer-led asthma self-management program for inner-city teens in Buffalo, Baltimore, and Memphis. The Peer-led Asthma Self-Management for Adolescents (PLASMA) program examines the effects of the intervention program in improving self-management and overall outcomes of asthma in teens. She has also been developing a clinical study of an interactive text messaging system to help teens and their parents with daily asthma management and facilitate parent-teen partnerships through information sharing in a timely manner. Rhee joined the University of Rochester School of Nursing faculty in 2007 and was named endowed chair of nursing science in 2015. She was inducted as an American Academy of Nursing fellow in 2016. Improving asthma self-management in adolescents. Effects of an asthma self-management program on adolescent peer leaders. Effects of peer-led asthma self-management program for adolescents. Barriers to Adherence as a Mediator Between the Perception of Family Support and Asthma Outcomes in Adolescents. Relationship between Perception of family support and quality of life in adolescents with asthma. Inaccurate Symptom Perception and Morbidity Outcomes in Adolescents with Asthma. Parent-Child communication About Female Adolescent Tobacco Use: What do Mothers Say? Information technology and asthma management programs in adolescents. Building a research partnership for youth tobacco prevention. Application of a computer-assisted intervention and an on-line data collection method in rural adolescents with asthma. Decision making quality and risk behaviors in adolescents with asthma. Protective factors and female adolescent nonsmoking in rural Virginia. Living with Asthma: A Focus Study of Adolescents with Asthma. "I wish I could do more": Psychosocial experiences of adolescents with asthma. Examining physical symptom patterns using person oriented approach. Patterns of Physical Symptoms in Adolescents: Application of a Clustering Method. Beliefs and Norms of Nonsmoking African American Adolescents. Protective Factors and Youth Nonsmoking Behavior. Physical Symptoms in Children and Adolescents from a Developmental Perspective. Prevalence of Recurrent Somatic symptoms in U.S. Youth. Headaches in U.S. youth: Examination of gender and racial differences in the prevalence and causal factors of headaches. Prevalence and predictors of headaches in U.S. adolescents. Depression, self-esteem, and insomnia as predictors of headaches in adolescents. Toward Healthy Children 2000: New Approach to Conceptualizing Health in Children. Rhee, H., Love, T., & Harrington, D. (2018). Blood Neutrophil Count is Associated with Body Mass Index in Adolescents with Asthma. JSM Allergy and Asthma, 3 (1), 1091. Mammen JR, Norton SA, Rhee H, Butz AM. (2016). New approaches to qualitative interviewing: Development of a card sort technique to understand subjective patterns of symptoms and responses.. Int J Nurs Stud. (58), 90-6. Conn, K., Fisher, S., & Rhee, H. (2016). Parent and Child Independent Report of Emotional Responses to Asthma-Specific Vignettes: the relationship between emotional states, self-management behaviors, and symptoms.. Journal of Pediatric Nursing, 31 (1), E83-E90. Groth, S., Rhee, H., & Kitzman, H. (2015). Relationships between BMI, physical activities and sedentary behaviors in adolescents with asthma and without asthma.. Journal of Asthma. Rhee, H., Belyea, M., Sterling, M., & Bocko (2015). Evaluating the validity of an automated device for asthma monitoring (ADAM).. Journal of Medical Internet Research., 17 (10), e234. Rhee H, Belyea MJ, Sterling M, Bocko MF (2015). Evaluating the Validity of an Automated Device for Asthma Monitoring for Adolescents: Correlational Design. Rhee H, Belyea MJ, Sterling M, Bocko MF, 17 (10), e234. Rhee, H., Fairbanks, E., & Butz, A (2014). Symptoms, Feelings, Activities and Medication Use in Adolescents with Uncontrolled Asthma: Lessons Learned from Asthma Diaries.. Journal of Pediatric Nursing, 29 (1), 39-46. Rhee, H., Allen, J., Mannen, J., & Swift, M. (2014). Mobile Phone-Based Asthma Self-Management Aid for Adolescents (mASMAA): A Feasibility Study.. Patient Preference and Adherence, 8, 63-72. Rhee, H., Miner, S., Sterling, M., Halterman, J., & Fairbanks, E. (2014). Development of An Automated Device for Asthma Monitoring (ADAM) for Adolescents: Methodologic Approach and User Acceptability. Journal of Medical Internet Research: mHealth and uHealth, 2 (2), e27. Mammen, J., Rhee, H. (2012). Concept analysis: asthma self-management in adolescents.. Pediatric Allergy, Immunology, and Pulmonology, 25 (4), 180-189. Rhee, H., Belyea, M.J. & Halterman, J.S. (2011). Adolescents' Perception of Asthma Symptoms and Use of Health Care Services. Journal of Pediatric Health Care, 25 (2), 105-113. Rhee, H., Belyea, M., Hunt, J. & Brasch, J. (2011). Effects of a Peer-Led Asthma Self-Management Program for Adolescents.. Archives of Pediatrics & Adolescent Medicine, 165 (6), 513-519. Kulbok, P.A., Meszaros, P.S., Botchwey, N., Hinton, I., Anderson, N.L., Rhee, H., Bond, D., Hartman, K., Noonan, D., & Bovbjerg, V. (2010). Mother-daughter communication: A protective factor for nonsmoking among rural adolescents.. Journal of Addictions Nursing, 21, 69-78. Rhee, H., Belyea, M.J. & Brasch, J. (2010). Family Support and Asthma Outcomes in Adolescents: Barriers to Adherence as a Mediato. Journal of Adolescent Health, 45 (5), 472-478. Rhee, H., Belyea, M.J., Ciurzynski, S.M., & Brasch, J (2009). Barriers to adhering asthma self-management in adolescents: Relationships to psychosocial factors. Pediatric Pulmonology, 44 (2), 183-191. Rhee, H., Belyea, M.J. & Elward, K.S. (2008). Patterns of Asthma Control Perception in Adolescents: Associations with Psychosocial Functioning. Journal of Asthma, 45 (7), 600-606. Rhee, H., Ciurzynski, S.M. & Yoos, H.L. (2008). Pearls and Pitfalls of Community-Based Group Interventions for Adolescents: Lessons Learned from an Adolescent Asthma Camp Study: Lessons Learned from an Adolescent Asthma Camp Study. . Issues in Comprehensive Pediatric Nursing, 31 (3), 122-135. Kulbok, P. Rhee, H., Hinton, I., Botchwey, N., Bovbjerg, V., & Anderson, N. (2008). Factors influencing non-smoking adolescents. Public Health Nursing, 25 (6), 505-515. Rhee, H., Hollen, P.J., Belyea, M.J., & Sutherland, M.A (2008). Decision-Making Program for Rural Adolescents with Asthma: A Pilot Study. Journal of Pediatric Nursing, 26 (3), 439-450. Rhee, H., Hollen, P.J., Sutherland, M.A., & Rakes, G. (2007). A pilot study of decision making quality and risk behaviors in rural adolescents with asthma. Pediatric Asthma, Allergy and Immunology, 21 (2), 93-104. Rhee, H., Wenzel, J. & Steeves, R. (2007). Psychosocial experiences of adolescents with asthma: Focus group study.. Journal of Pediatric Health Care, 21 (2), 99-107. Rhee, H., Wyatt, T., & Wenzel, J. (2006). Adolescents with asthma: Learning needs and internet use assessment.. Respiratory Care, 51 (11), 1441-1449. Rhee, H., Holditch-Davis, D., & Miles, M.S. (2005). Patterns of physical symptoms and associations with psychosocial factors in adolescents.. Psychosomatic Medicine, 67 (6), 1006-1012. Rhee, H., Miles, M.S., Halpern, C.T., & Holditch-Davis, D. (2005). Prevalence of recurrent physical symptoms in US Adolescents.. Pediatric Nursing, 31 (4), 314-319. Rhee, H. (2005). Racial/ethnic differences in adolescents' physical symptoms.. Journal of Pediatric Nursing (20), 153-162. Rhee, H. (2005). Relationships between physical symptoms and pubertal development.. Journal of Pediatric Health Care. (19), 95-103. Rhee, H. (2003). Physical symptoms in children and adolescents.. Annual Review of Nursing Research, 21, 95-121. Rhee, H. (2002). Physical Symptoms in U.S. adolescents: Prevalence and Patterns.. Dissertation Abstracts International, 63 (3). Kristjansdottir, G., & Rhee, H. (2002). Risk factors of back pain frequency in schoolchildren: A search for explanations to a public health problem.. Acta Paediatrica (9), 849-854. Rhee, H. (2001). Risk factors and sequelae of headaches in schoolchildren: Clinical implications from a psychosocial perspective.. Journal of Pediatric Nursing, 16 (6), 392-401. Rhee, H. (2001). Additional thoughts about racial differences in the prevalence of headaches in US adolescents.. Headache, 41 (4), 419-420. Rhee, H. (2000). Prevalence and predictors of headaches in US adolescents.. Headache, 40 (7), 528-538.